. @EcoMediaCBS & @AdoptACharger w/#Chevy http://3bl.me/appvbr @ #MalibuCreekStatePark plugging in new EV chargers! Malibu, CA, August 22, 2013 /3BL Media/ – Two of the most popular State Parks in Southern California – Leo Carrillo State Beach and Malibu Creek State Park – now have even more appeal for plug-in electric vehicle owners with the addition of new, free charging courtesy of Chevrolet’s funding through their EcoAd advertising with CBS EcoMedia Inc. The two, 240 volt , chargers can accommodate up to four plug-in electric vehicles. The units were installed at the two parks by EcoMedia’s nonprofit partner, Adopt A Charger. Chevy’s funding will provide free charging and service and maintenance for the charging stations for three full years. 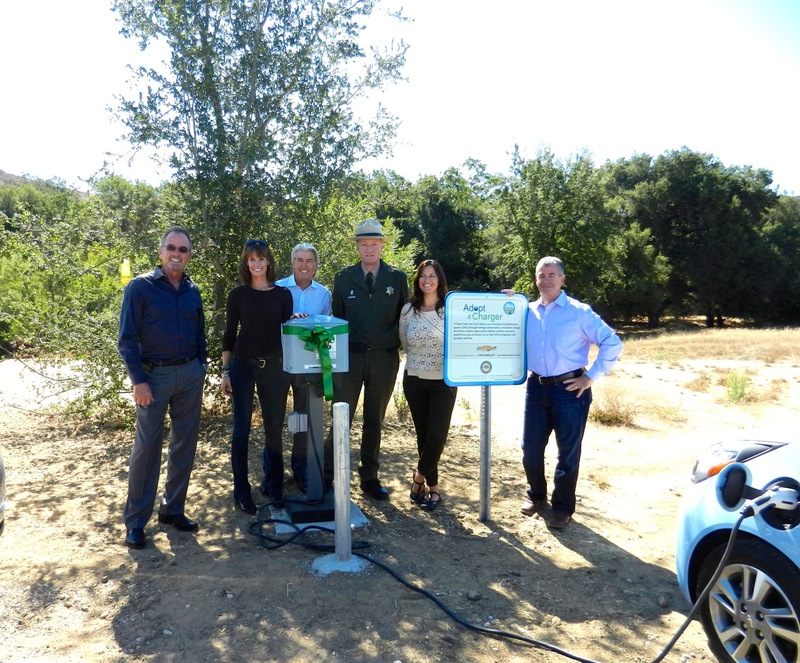 A ribbon-cutting celebration was held today at the site of the new Chevy-funded EV chargers in front of the Malibu Creek State Park Administration Building near the day-use picnic area. The ribbon-cutting celebration was hosted by Craig Sap, California State Parks Superintendent for the Los Angeles District; Chevrolet Group Manager, Western Region Communications, Dave Barthmuss; Kitty Adams, Executive Director, Adopt A Charger, Inc.; and CBS EcoMedia President and Founder, Paul Polizzotto. Special guests included Alexandra Paul, Co-Founder, Plug-In-America, a Chevy Volt owner; along with several other Chevy Volt and Chevy Spark EV drivers and other interested plug-in car enthusiasts. Chevy brought out two Chevy Volts and a new Spark EV for test drives and several attendees availed themselves of the opportunity to get behind the wheel of the battery-powered vehicles. California State Parks recreational activities and outdoor experiences draw approximately 85 million visitors each year –an increasing number of who drive plug-in vehicles. Installation of EV charging stations is part of the “Cool Parks” initiative by California State Parks that responds to the pressing challenges of climate change and seeks to educate park visitors, and motivate the broader public to be part of the solution. By “adopting” these chargers, GM becomes a Proud Partner of the California State Parks. The newly installed EV chargers at Leo Carrillo State Beach are conveniently located in front of the Visitor’s Center in the day-use parking lot, and are visible from Pacific Coast Highway. Leo Carrillo is in the heart of Malibu and well known for its exquisite campground area and top-notch surf spot with beautiful beaches. Malibu Creek State Park, located four miles south of Highway 101 on Las Virgenes/Malibu Canyon Road is an urban oasis a short 25 miles from downtown Los Angeles. The park features hiking, swimming, fishing, bird watching and horseback riding opportunities. Chevrolet’s funding comes through its partnership with EcoMedia and their unique advertising program that connects advertisers with tangible health, environmental and education projects in communities across the country. Adopt-a-Charger is a 501(c)3 nonprofit organization founded in March 2011 to accelerate the wide spread adoption of plug in electric vehicles by broadening the charging infrastructure. Adopt-A-Charger’s unique approach matches a sponsor with a host site located at a popular public destination: parks, colleges, museums, beaches and the like. By “adopting” a location, the sponsor agrees to pay for equipment, installation, maintenance, and administration fees for three years (occasionally utilizing grants and/or host contribution). At EcoMedia, we’re propelled by the desire to create positive social change; that’s been our mission since we founded the company in 2002. In 2008, after successfully partnering with CBS on a wide range of environmental projects, EcoMedia became the newest addition to the CBS Corporation portfolio, exponentially scaling our reach across television, radio, interactive, publishing and outdoor media.